Experience this exciting cliff side walking! Breathtaking scenery from the high walkway at the gorge. "I enjoyed the tour and am glad i did it and saw the canyon and scenery. I was not anticipating the huge crowds giving the bad weather and prefer to see nature in..."
Meeting Point: Malaga: Plaza de la Marina. Entrance ticket to Caminito del Rey. Transportation. Pick up and drop off from Malaga. Expert and fun Tour Guide. If you would like a personalized tour with quality information from an expert guide, we offer you this guided tour through Caminito del Rey on a small group, just english speaking, with transportation included from Malaga. The Gaitanes Gorge contains the unique "King's Walkway", located in El Chorro Natural Park which provides the perfect setting for a exciting walkable experience with unbelievable landscapes, encompassing a rocky plateau 1200 m above sea level. The estimated time needed to go across the whole route is 3-4 hours. The total length of the route is 7.7 km, divided into 4.8 km long access ways and 2.9 km the way called as the real King's Walkway. The most famous part of the trail, is the 2.9 km King's Walkway, from the entrance control to the exit control point, which comprises 1.5 km long boardwalks (located at the gorges), and 1.4 km long paths or forest walkways between the two gorges. Usually the group takes a tunnel at the entrance, saving 1 km walking through the forest, so the total lengh of this excursion is 6.7 km. Caminito del Rey was re-opened to the public on the 28th of March 2015 and it is part of a spectacular natural beauty spot in Malaga countryside. The boardwalks and a hanging footbridge that stands at 105 metres height, as well as steep walls, make many visitors feel inevitably dizzy, but in general people get used quickly and enjoy the feeling from the beginning. There is not risk at all, but you must be aware of the strong impression this place might make on you. The path is hazardous because of the heights and its very narrow parts. This is why it is so attractive. Discover this natural treasure with lots of histories told by the expert guide and have the chance to walk the walkway suspended 100 metres high! It can be closed because of the weather (rain, strong wind). Optional Lunch & Breakfast (32€), increases additional time of the tour in 3 hours. Kids over 8 years of age are welcome, always accompanied by a responsible adult. Kids under 8 years old are not allowed to enter. In a sunny day, don't forget comfortable clothes, sunglasses, sunscreen and water. To come with shoes no appropriated to have a walk, specially flip-flops and heeled shoes. To carry backpacks, bags or any other big object included sticks and crutches. To take photos or videos with a tripod or to use cameras and equipment that can block other visitors' way. Free cancellation until 7 day(s) before starting time. "I enjoyed the tour and am glad i did it and saw the canyon and scenery. I was not anticipating the huge crowds giving the bad weather and prefer to see nature in uncrowded areas. The guide was good and provided lots of interesting information. The tour lacked something that I cannot put my finger on. I found the pace way too slow. 4hours to walk 7km is a snail pace. We would have had ample time for photos and could have had a lunch stop (if we had been told) if we had walked at a normal pace. Half of our group were stopped waiting for the rest of the group for much of the time and it was annoying as the guide had to stay back with them so in the meantime we missed out on whatever info he was conveying. I'd have preferred a faster pace much longer walk through the canyon but it is what it is and was worth doing nonetheless. " "The tour was amazing. Jose was very informational and friendly, he made the trip so much fun! Me and my friend thoroughly enjoyed the whole experiece. " "Pablo,our guide was wonderful,dealing equally as well with pensioners and students. His knowledge and humour made day. The walk experience is unique so check out the website before booking the trip"
"Jose Padilla was a fantastic guide, our thanks for a wonderful walk and comments trough this trip ! " "If you love the outdoors don't miss this trip! Our guide Jose was fluent in many languages, as well as history, geology, flora and fauna. This was the highlight of our week in Spain! " "Fantastic walk with Jose and two other guests! Highly recommended!" "We appreciated the small group atmosphere. The guide was funny, helpful and informative. The information he provided was useful and surely matched the spectacular natural setting." "Fabulous tour! Had an awesome day and met some lovely people. Our guide Pablo was extremely friendly, knowledgeable and passionate about the area. He also introduced me to other people who spoke English. Even on the bus on the way to and from the Caminto del Rey, Pablo shared history of the area and the people. Thank you so much! " "Pablo was great! Very knowledgeable and fun." "It was great! The guide José was very enthusiastic and friendly and taught us a lot about the Camino and the vegetation. It was really interesting and fun. I have no ideas for improving this tour.Sincerally, Rian." "Glad that we chose the small private group option as we were only 8 and thanks to Jose Padilla we really had a great time. Enough time to enjoy the nature, views, taking pictures and all this topped up with alot of interesting information. would do it again and again..... "
"We really enjoyed a fantastic day with José who delivered a never ending stream of wisdom : )"
"Well organized trip, on time pick up and drop of from central Malaga. Excellent guide who shared interesting history during walk. " "This was the best tour of my 4 weeks in Spain . Jose was a master of geology and history. It wasn’t just a hike it was an education . If you go on this tour make sure to ask for Jose. The hike itself was really worth it . I like the Caminito del Rey more than the Grand Canyon because it’s narrow and you can really get up close. Don’t miss this tour. " "Fantastic experience. Well and informatively arranged, and in a small group. Super nice local guide who knew a lot about Caminito del Ray. " "Very pleased with the small group. Also very pleased with the guide. Spoke about the Camino bit also about fauna and flora.😉"
"That is how such kind of services should be provided! Trip guied by Jose was really amusing and organized really well. Thanks!" "We har a fantastic trip with our excellent guide, Jose Padilla!" "Jättebra resa och guide - Great trip and guide." "We enjoyed our day tremendously! The Caminito was as spectacular as expected and our guide Pablo was excellent! He was friendly, informative and managed to create a relaxed athmosphere in the group, handling some awkward situations very smoothly. Three cheers for him! We had a really great day." "Pablo was a great guide. Lots of info on the place. Great experience. Delay at pickup was a pity but rest of the day more than made up for it"
"Jose was an exceptional guide, passionate about his job, highly informative and a great sense of humour. He tailored the tour to the participants so that they get full enjoyment and value for money. The views are spectacular, it is not a strenuous hike, and a great tour guide makes it an overall fantastic experience. I really recommend this tour. " "Very good tour with a very experienced guide. A lot of intesting explanations were given by him. He looked after the group very well. We appreciated to be in a small group. El Caminito del Rey is incredible. " "We really enjoyd this trip! Excellent guide, and we loved that the group was small. " "Great guide, great scenery, great food, great trip. When of the best experiences I have ever had travelling. Jose Padilla is the best!" "A fantastic trip with a knowledgeable and friendly guide who took the time to ensure the whole group benefitted from his ability to explain and appreciate the Caminito and its surroundings." "We had a great time. Jose has lots of information about the Canyon and geology." "Best day tour we had in our 18 days in Spain and France. Thoughtful insights, great meals, personal attention, it was a fantastic tour from start to finish. I am very impressed with Jose and the company." "Great day thanks to our outstanding guide Jose. Not only very knowldgeable but also really entertaining. Best guide ever!!! And the Cminito del Rei is definitely a must if you are vistiting the area around Malaga." "If you consider doing the Caminito Del Rey Tour please book with Smart Holidays Andalusia! The tour was so amazing and our Tourguide Jorge did a great job guiding us through the canyons and showing us every detail and giving a lot of background history! I appreciated the fact that he wasn't in a rush at all and even decided himself to let other groups pass so we would have more time by ourselves to talk and for the presentation. He was very kind and took photos for all the group members whenever they wanted to take a nice picture. Our group consisted of around 8 people and I would definitely book again with his company! :) Thank you so much for an unforgettable day in the Caminito!" "quick and surprisingly easy way to book excursions. Easy to understand website and things went very smoothly." "My girlfriend and I had a fantastic day to caminito del Ray, with Malaga Trips our guide Jose Padilla, was super engaged and sweet. In a good and convenient way. When we walked the route it was okay. that we were once in a while walked in our own speed. We were part of a Nice small group and there was control of all things about transport, security and all. We were even called up at the collection site, announcing that there is a slight delay of 5-10 minutes. All in all, a fantastic nature experience and we were safe and professionally conducted throughout the day." "What a great day we had! Our guide, Jose was engaging, interesting and very good at tailoring the tour to the audience. The pace was very gookd with time enough to enjoy the entire experience. I highly recommend this tour." " What an amazing day! Definitely do the breakfast and lunch option. This is a trip I would definitely do again 😀"
"Jose gave us a fantastic guided tour of the Caminito. We learned a lot about this place, he history .. and lots of other issues besides. Thoroughly enjoyed this day. I recommend taking the breakfast option in particular." "Our tour guide Jose was a super awesome guy! Really passionate and full of the knowledge of the region he was taking us through. Caminito del Rey was beautiful and a worthy destination to visit. So much history in one place. Amazing!" "Phenomenal trip! Highly recommend it. Loved exploring such a beautiful and unique place with a small group of people and a very passionate expert. We did the breakfast and lunch package too, and the food was delicious. They were extremely flexible to accommodate food allergies too. Thank you, Jose and Javi, for a wonderful experience." "Pablo Cobos is a great guide. All was well organized. I recommend this tour to anyone who is not afraid of high places. Caminito del Rey is impressive. " "We boekten een dagtrip, we waren immers met vakantie.Het is januari en nog niet zo druk - onze gids hadden we voor ons alleen....geweldig! Geweldig mooie omgeving, leuke uitleg, prachtig weer.....nadien met de shuttle bus terug naar het beginpunt. Uitgebreide lunch op een prachtige plek....'s avond om 17:30 terug in het centrum. We hadden een fantastische dag - geweldige ervaring, prachtig natuurschoon! Zeker doen!!" "Jose was brilliant- enthusiastic and informative. Journey was pleasant and easy- as it’s not too exertional! Highly recommend!" "It was great! I and my sister loved amazing views Caminito del ray. Minibus drive us safely there and back, thanks to driver. We like to walk our own way, but what we listening our guide short time, he is very nice and competent guide. Thank you for the trip!" "Jose is a fantastic guide: Very engaged, intelligent and has a very broad range of interests. And a very enthusiastic storyteller. You should meet him!!" "The tour was cancelled the day before but the service and co-operation has been excellent. Definitely use them in the future." "Entire trip was excellent organised. The tour guide was fabulous. He was very helpful and provide a lot of interesting information. 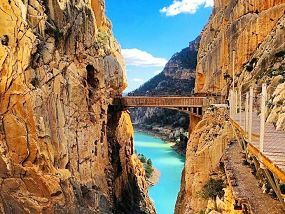 I strongly recommend Caminito del Rey Tour." "We had a lovely day at the Caminito del Rey. Our guide Pablo was brilliant, he was friendly and informative with lots of little stories to keep things interesting. The group was a great size and we never felt hurried along. The walk is beautiful and really worth it if you want to see the country around Malaga." "Fue un día extraño! Me gustaba mucho. Recomiendo esta excurción! " "It was great! Awesome guide who showed and explained us a lot and who was motivated until the last minute of the trip. We enjoyed the tour very much and will definitely recommend to our friends. " "Very good experience! Guide was excellent "
"The tour was great and I highly recommend it. The only area for improvement is that the pick-up location should be more clear (the email said it was at the tourist info centre but the actual location was on the side of the street about 250m away from the tourist information centre). There was a bit of confusion for our pick-up and I would recommend having a sign or having a vehicle with the company name/logo on it to help travellers identify the pick-up location. Still a great tour that I highly recommend. Jose is a very informative guide. Thank you!" "The tour was amazing and so much more than I could have imagined. Our guide was very passionate and knowledgeable. Since he hiked the Caminito del Rey before the new platforms were installed he has some great stories about what the hike used to be like. I recommend doing the hike that includes breakfast and lunch, it's worth it! This small tour will be much more enjoyable than the large group tours that are run by the cruise ship companies! I have not included a photo because the truth is, no matter how amazing the photo, it will never do the Caminito del Rey justice, it's just to beautiful. You have to see it with your own eyes. While there is a path, hike is not a term that should be used lightly here. If you are not healthy enough for physical activity or are not bringing shoes with traction that lace up (hiking shoes or tennis shoes), you should not attempt this hike; other than that I recommend it to everyone. " "We really enjoyed the trip to Caminito del Rey. Jose was a great guide and it was interesting to learn the history of the walkway." "ignore all the other big tourism traps and book your trip with Malaga Trips today! Jose was a great guide - giving us his personal history which made the trip so special. " "Jose was great guide through this tour. Caminito is absolutly amazing place to visit. " 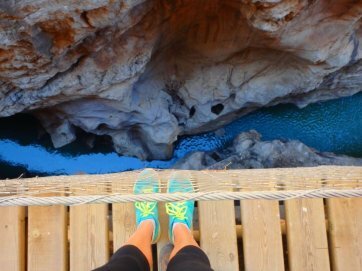 "Jose was a fantastic guide, we loved our trip to Caminito del Rey. A wonderful experience. " "We had a great time with Jose an a very memorable one as well taking photos for us couples at all his recommended sites. He was well prepared with his iPad and old photos of the kings visit to the site and I admire him. He also related sites to scenes of movies shot in the area with Frank Sinatra. Well done Jose. He even gave us a taste of the carob tree pods where they are used to make chocolate for warmer countries. Well done Jose, you added a highlight to the awesome caminito day trip for us not just the gorges but your lively character for us to take away for our life. " "Very well organized and flexible to meet our needs"
"Jose was a prefect guide! He was really fun and the explanations were perfect, not too much but not even a few. He was really helpful with everyone, especially if someone was fatigued. I suggest this experience to everyone and I will remeber this walking FOREVER!!! " "The trip was great. Our guide Pablo was very nice. The only thing that was not so nice was that the bus had a problem and we were standing somewhere on the motorway waiting for the bis driver to repair the bus." "I would like to say that pablo was an very enthousiastic and a good guide. He gives good information about everything and i like to thank him in this way. Greetz Thom Schepers"
"Me and my son had a great trip to Caminito Del Rey Thursday the 3. of august. What a fantastic nature alle the way, and José is a very dedicated tour guide, with a fantastic knowledge about the area. We will definitely choose Malaga trips again when we come back to Malaga. Best regards Jesper and Milo Danstrom"
"We had a very great experience. It was the most beautiful trip! And we were very happy to have a guide with us that could tell us about the place and point out the things we needed to put attention to. It was really hot yesterday and he was kind to look after us to see if we had enough water. Another thing was that we were very happy to be picked up by the bus after the trip. At that point we were so tired so it would have been exhausting to wait for public transportation. Unfortunately the aircon was broken." "We had Jose for the trip and he was absolutely excellent! Gave an incredible amount of knowledge on geology, history, Caminito del Rey in films and was really friendly and funny. He made sure we were looked after on what was a really hot day to do the walk (35 Celsius) and overall was a great trip. 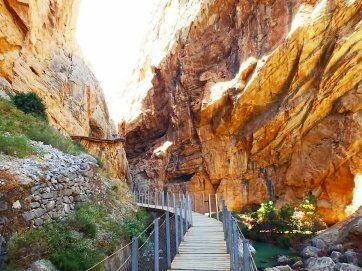 I highly recommend booking with Malaga Trips especially with Jose as your guide for Caminito Del Rey, it really made the walk more interesting with his knowledge. " "the trip was awesome as the place is really stunning. But what is also woth mentioning is our fantastic guide, Jose, very friendly, trying to accomodate everyone's wishes and necessities and sharing his knowledge!!!" "Beautiful place, remember to take water and snacks. Not physically demanding but five hours in the sun and hot conditions was a challenge. Great visit to Caminito del Rey with Jose. He is fabulous and ethusiastic guide which made our day to remember. Lots of information tailored to suit our interests. Highly recommended!" "We had a lovely experience today in El Chorro. Our guide José Padilla shared his vast knowledge about the history, geology, and plantlife of the area which made the day one to remember for a long time. We where very satisfied and would recommend your trip (and José) to other people traveling to Malaga." "Spectacular trip, super friendly and very informative guide and excellent organisation (transport, time etc.). I would recommend this to anyone visiting the Malaga region." "Personalised guided tour with real and informative knowledge provided by Jose. He was personable, fun and genuine. This was a perfect ending to my Camino in Spain. Thank you so much. " "Great trip!! Would do it again The pick up was easy and convenient. Having a driver made the expierence more relaxed and less stressful. Jose Padilla, our guide, was incredibly knowledgeable and enthusiastic. He provided historical information, fun factoids, media, photos, and personal stories which added a personal touch to the tour. Also, the group size was small (~8) which made it easy to maneuver around the trails. " "Jose Padilla provided an excellent tour with information on History, geology and his own experiences growing up in the area. A day we will always remember. " "We had a great day at the Caminito del Rey with an very enthousiastic guide. We learned a lot about the environment. " "Oh my god it was amazing experience we met very nice people our guide was so so nice , must do , my son and I had the best time in Malaga thank you very much "
"Hose! Best guide we've ever seen. We could easily see that he loves his job. Also the small group allowed us to feel the place closer. We had a very special and magnificent experience walking the El Caminito del Rey!" 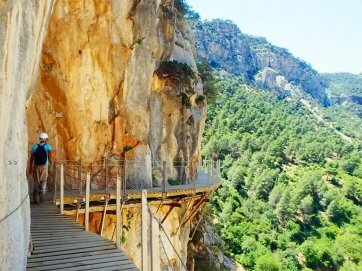 "The guide, José, gave us a perfect day at Camenito del Rey. No rush, a small group and very good at describing the geology and the history about Caminito del Rey.b"
"I had a very pleasant day out at Caminito del Rey. Jose is a very good guide sharing his broad knowledge about Antonio Banderas till more serious stuff like the water delivery system and the Caminito's history as well as about local fauna. I'm still impressed by the history of the carbot tree. Thank you for a pleasant day with good company and breakfast/lunch." "Jose was AMAZING!!! Great guide who was very relaxed and knowledgable and really kept us interested with what he was saying. Loved every minute of it! " "Fantastic day out with total attention from guide who was super attentive to the small group. The trip was phenomenal in it's beauty. 150% happy. " "Jose was our tour guide and he was wonderful. He is passionate about his guiding. He is so knowledgable and so generous with his time. We couldn't have had a better guide and I would like him to know how much we appreciated him. " "Jose was so cheerful and enthusiastic about the walkway, it's history and geography. We came away having had a thoroughly enjoyable day. I would highly recommend this trip "
"Jose was an excellent guide "
"Our guide Jose is a cool dude with a passion for his job and for the awesome Caminito Del Rey. He will ensure that you get great pictures, share stories with you and even share his almonds." "One of the best guides I have ever experienced in all my years of travel." "Jose was professional and friendly, and provided the group with a lot of knowledge, including the history and geology of the area. A most enjoyable day. " "We had the best day at El Caminito, our tour guide was fantastic. I strongly recommend this tour! " "It was a great experience! Our guide is very knowledgeable, funny and flexible. We had a very nice group and lunch was delicious. I super recommended this trip with them. :-)"
"The trip was one of the most memorable experience for me & my family. thank you very much." "The guide was very good and he had a lot of knowledge not only about the canyon but lot of other things too"
"Jose is a great guide. The walk can be scary for vertigo sufferers,but is safe. More informative to be guided than alone. A good day was had by our group and us and our friends "
"We were picked up from the hotel in a comfortable vehicle. The guide was excellent, well-informed and amusing company. We contemplated making our way to the gorge ourselves,this would certainly have been cheaper but a lot more hassle and we would not have discovered as much." "Fantastic views! Fascinating history! Lots of amazing facts unveiled by passionate guide who has personal bonding to this place. Thank you a lot, Jose! " "From the moment we were picked up from our hotel to when we got back the level of attentiveness and information was amazing without being overpowering. It felt like you were part of a family outing in which you were made very welcome. This trip is definitely worth every cent as it takes away the stress of transport, meal stops and getting through the busy queues. Jose was always willing to impart his knowledge throughout the walk including the geology, vegetation and his own experiences of the walk before the safe path was built! But he was also keen to discuss his views on football, politics, SPANISH Olive Oil and fatherhood (he had just had his 2nd child). My teenage son even enjoyed it and that's saying something!!" "The tour was great, and with the guide we had knowing so much about how and why the area looks today, it was just good. We also had the benefit beeing a small group, and with guide on allowed to was just this group. 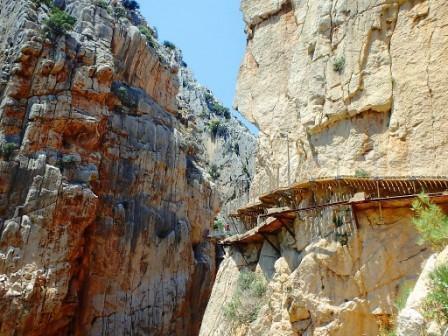 By this we had a lot of time just to enjoin the walk true the great Caminito del Rey." "I had an excellent experience with Malaga Trips: they helped us book everything even if it was super-last minute (just before New Year's). Nicolas was very helpful and Cristina, our Caminito del Rey guide, was very very nice and super-knowledgeable. " "Everything went as planned before. The visit to el Caminito was great and the views better that you expected beforehand. Our guide made the trip perfect. He used time to explain small details with wery interesting way. He took care from those who seemed to be a bit afraid. He had also knowledge from the old route/ own experience. I wish to see you soon again." "Our guide Jose Padilla was really excellent and gave us much information about history and nature of Caminito. "